By self-publishing an audiobook, both self-published and traditional authors can potentially expand the audience for their book's content and perhaps find an additional revenue stream for their work. Historically, audiobooks (aka "recorded books" or "books on tape") have provided a format for those who prefer to listen to their books rather than read them. Joel Schwartzberg, the author of the well-reviewed and traditionally-published The 40-Year-Old Version decided to self-publish the audiobook. In this Q&A, he shares what he learned. Valerie Peterson: What made you decide to self-publish an audiobook version of your "​humoirs"—, your book about being a divorced dad? Joel Schwartzberg: As a former competitive public speaker, I always wanted to do an audio version of the book, especially so I could capture the humor and some of the subtext and insinuation with my tone and timing. But it always seemed very expensive and time-consuming. Frankly, I thought you had to be connected to a major publisher to get it done. VP: So what made you rethink that and look into doing the audiobook version? JS: The book is perennially very relevant as divorce rates are still high and divorced/remarried dad are still questioning their identities and looking for paths to happiness and personal fulfillment. I usually do a big marketing push around Father’s Day – publishing essays, buying Facebook ads, doing blog outreach, contacting stepmothers (!) – so I thought Father's Day would be great timing to do an audiobook launch and promotion. 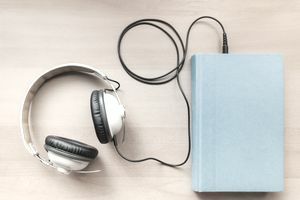 What helped me take the audiobook idea seriously was a service called Audiobook Creation Exchange (ACX.com) – a service from Audible and its parent, Amazon – that connects authors, narrators, and studios. ACX helped me find Brick Shop Audiobooks, an audio studio in Brooklyn, which — for a cheaper price than I expected — professionally recorded, directed, and published my audiobook. Because Brick Shop already had a relationship with Audible, they were able to produce the audio to the exact specifications for Audible, Amazon, and iTunes. So it's DIYWPH — Do-It-Yourself–with–Professional-Help. The nice part was that it was fairly inexpensive. How Much Does It Cost to Self-Publish An Audiobook? VP: Joel, would you share how much it cost? JS: It cost me around $450 for what is roughly a three-hour finished audiobook — so, $150 per finished hour for everything. Of course, since I narrated the book myself rather than pay to hire a professional narrator, it was cheaper for me than for someone who needs or wants to hire someone to narrate his or her book. VP: Speaking of expert audiobook narration hints, you've got a public speaking background. What hints would you give to those who are considering narrating their books themselves? Read the whole book – out loud, not in your head — a few days in advance. It will refresh your familiarity, but also alert you to lines where you’ll want to add vocal emphasis. A cold reading is a bad idea because, ideally, you want to sound like the world’s leading expert of your material, even if it’s fiction. Work with a professional audio company. My director would often stop me if I mispronounced words, or said a line in a way that buried its point. They held a high standard for the quality of both the reading and the recording, which was crucial. Read slowly, and use pauses often. It takes more time to listen than it does to read. Give the lines – especially complex ones or jokes – time to sink in. Have energy. Don’t let the end of sentences trail off. You’ll need to capture – and hold – your listener’s attention from the first word to the very last. Don't think that you're reading a book; think that you're giving a speech to a large audience. This will put you in a more presentational mode. Listening to an audiobook should be like live theater or a live seminar more so than attending a simple book reading. VP: What was the biggest hurdle you had to overcome to getting the audiobook produced? JS: Probably the biggest thing I had to overcome to produce my audiobook was simple intimidation – How much time will it take? How much will it cost? What happens when I’m done? – but with help from some modern technology, these were surmountable obstacles, and I’m thrilled with the professional result. Joel Schwartzberg is an award-winning essayist and screenwriter, national champion public speaker and speech coach. He was a Head Writer for Nickelodeon in 1998 and is currently an Internet executive; his have appeared in a wide range of publications.